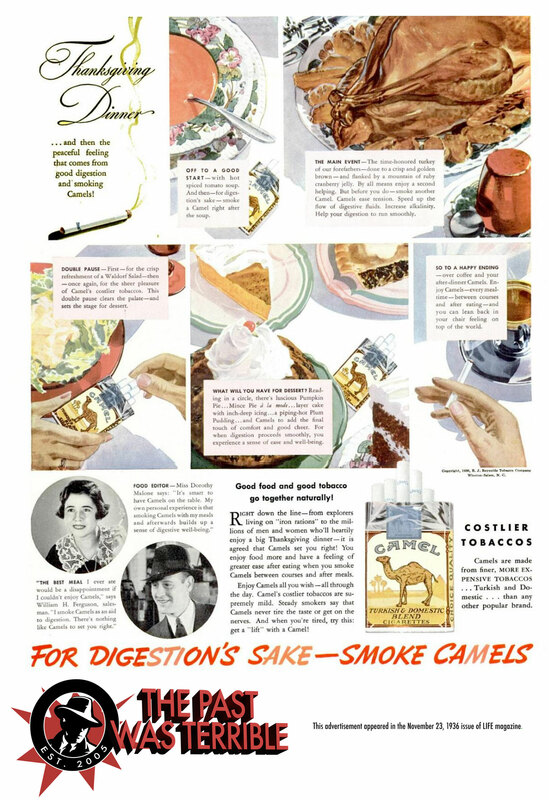 No matter where you celebrate Thanksgiving and what you’re eating, take a moment to be thankful that this suggested tradition from the mind of a marketer never caught on: lighting up a Camel cigarette after every course of your meal. No, not after dinner, after every course. This ad is a Consumerist tradition, since it reminds us how terrible the past really was. Even if future generations might judge us for having cups of soda with every course of our holiday meals today. It appeared in LIFE magazine on November 23, 1936. “The best meal I ever ate would be a disappointment if I couldn’t enjoy Camels,” the man in the hat at lower left is quoted saying. He may have some low culinary standards. Fortunately, there are fewer Americans than ever smoking cigarettes of all brands between courses on Thanksgiving, and on every other day of the year.